In a 32-page report, the commission sharpened a sprawling set of prescriptions initially issued on March 1, only to see its work attacked by labor and quickly shelved as a closely divided legislature turned to the short-term task of closing a deficit, balancing the state’s $20 billion budget, and campaigning for re-election. The commission says the state needs to shrink spending by $1 billion, while adding revenue by modernizing its system of taxation and tax collection — not by raising tax rates. The panel backed away from a previous call to curtail collective bargaining for public employees, instead suggesting Gov.-elect Ned Lamont seek voluntary concessions. The new report says the state is choking on fixed costs — primarily payments on debt, Medicaid and retirement benefits — that are growing by nearly 6 percent a year and will comprise “a staggering 53 percent” of all state spending in the fiscal year that begins July 1. Connecticut, it concludes, must shrink its budget by $1 billion. “One of the things that we’ve discovered in the last nine months is people don’t understand the depth of the problems that have to do with fixed costs in Connecticut,” said Robert Patricelli, a retired corporate chief executive and the co-chair of the commission that was created by an act of the General Assembly. Technically, the commission no longer exists. Led by Patricelli and the other co-chair, former Webster Bank chairman and CEO Jim Smith, the former commission members continued their work as private citizens, meeting over the summer and fall with political leaders and community groups as they revised their initial report. The metrics of a state in fiscal crisis are stark, if familiar. Connecticut has posted budget deficits in every year but one from 2007 to 2016. Its economy actually shrank over 10 years, while the rest of the U.S. economy grew by more than 10 percent. And its unfunded pension liability is among the worst in the nation. Patricelli and Smith said they have briefed the leaders of every caucus but the Senate Democrats, whose leader was traveling and not immediately available. The new report is delivered as Lamont, a Democrat and Greenwich businessman who takes office as Connecticut’s 89th governor on Jan. 9, says he is looking for structural changes in state finances to break the cycle of deficits and stabilize the state’s economic climate. Lamont already has staked out a few positions consistent with the commission’s recommendations. Lamont said he will not raise tax rates or dip deeply into the state’s suddenly flush budget reserves, but instead seek to improve tax collections and find other efficiencies, some of which he says may require negotiations with state employee unions that agreed to two rounds of concessions during the tenure of Gov. Dannel P. Malloy. While state employees are due for pay raises after a freeze negotiated by Malloy, the commission is recommending extending the pay freeze, pointing to data indicating that Connecticut’s state employees and teachers are compensated better than their peers. Average annual wages for state employees in Connecticut were $69,963 in 2016, second only to New Jersey. The average in the Northeast was $60,105. Connecticut teachers are paid annual wages 15 percent higher than the national average. Teacher salaries are a local cost, but the woefully underfunded teacher retirement system is a state responsibility. 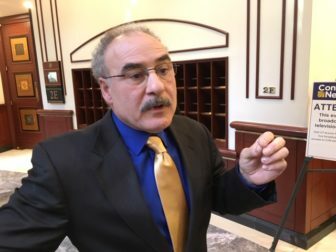 Connecticut can afford higher income taxes and remain competitive with New York and New Jersey, Luciano said. But he acknowledged that the rate of growth in fixed costs are not sustainable. Jan Hochadel, the president of AFT Connecticut, said the new report ignores the political realities of the past election: Democrats won strong majorities in each chamber of the General Assembly. The commission’s co-chairs said there were aspects of their recommendations that would be difficult for labor and business. The commission is recommending revenue-neutral tax reforms that it says would help stimulate economic growth, cutting the top income-tax rate from 6.99 percent to 6.7 percent and reducing business taxes. It proposes trading $700 million in tax cuts for more than $600 million in new revenue raised by taxing online sales, and broadening the 6.35 percent sales tax to goods and services now exempt, such as legal and accounting services for consumers, parking, dry cleaning, non-prescription drugs, dentistry, veterinary care and home renovations. The $600 million includes $148 million that would be raised by imposing a 2 percent sales tax on groceries. The impact on lower-income residents would be mitigated by exempting groceries purchased by food stamps and other aid programs. The commission also proposes to raise the earned income tax credit back to 30 percent of the federal amount claimed and raising the minimum wage to $15 per hour. The rest of the lost revenue would come from a 2 percent restaurant meals tax on top of the current sales tax, if the commission’s recommendations are accepted. The commission proposed a modest approach to electronic tolling — limiting them to new projects that cut congestion, such as new lanes on I-95.